Here we are, three and a half years into this thing, and I haven't done a summary of National Park Service dinosaurs (non-avian variety)? No better time than the Fourth of July! Time for another giant caption! 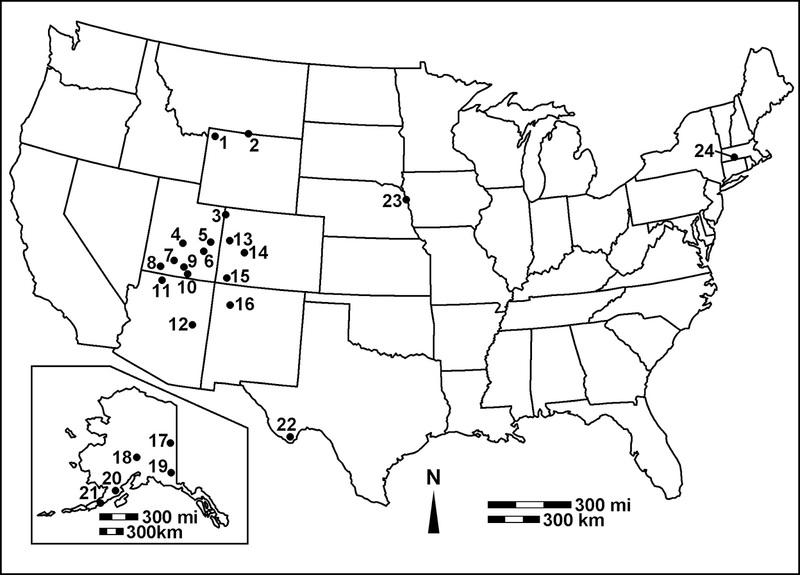 This map shows the National Park Service units where non-avian dinosaur bones or tracks have been found in situ, or are historically associated with a park. 1. Yellowstone National Park; 2. Bighorn Canyon National Recreation Area; 3. Dinosaur National Monument; 4. Capitol Reef NP; 5. Arches NP; 6. Canyonlands NP; 7. Bryce Canyon NP; 8. Zion NP; 9. Glen Canyon NRA; 10. Rainbow Bridge NM; 11. Pipe Spring NM; 12. Petrified Forest NP; 13. Colorado NM; 14. Curecanti NRA; 15. Mesa Verde NP; 16. Chaco Culture National Historical Park; 17. Yukon-Charley Rivers National Preserve; 18. Denali NP & Preserve; 19. Wrangell-St. Elias NP & Preserve; 20. Katmai NP & Preserve (possibly); 21. Aniakchak NM & Preserve; 22. Big Bend NP; 23. Lewis and Clark National Historic Trail; 24. Springfield Armory National Historic Site. As the map illustrates, the dinosaurian record of the National Park Service is concentrated in the Colorado Plateau and Alaska. The two big outliers, Lewis and Clark National Historic Trail and Springfield Armory National Historic Site, are also the two with caveats. In the case of the trail, the record is of a probable dinosaur bone observed by William Clark on July 25, 1806, within a few miles of Pompey's Pillar, Montana. This record can be considered historically associated with the event the trail was created to commemorate, even if it is not necessarily officially on the trail. The Springfield Armory record is our old friend the former type specimen of Anchisaurus polyzelus. This time the caveat is that the skeleton was found in the Water Shops of the armory, adjacent to but outside of the part now within the boundaries of the National Historic Site. Again, though, the fossil is part of the history that the historic site recognizes, so I include it. (Plus, coming from Springfield Armory is pretty All-American, and being one of the first decent dinosaur specimens recovered doesn't hurt, either.) These two records are also the oldest reports of dinosaurian remains associated with the National Park Service, and the Springfield Armory record also pulls in Edward Hitchcock. Thomas Jefferson, who among his other interests can be considered one of the founders of American paleontology, famously asked Lewis and Clark to keep an eye open for living mammoths; what would he have thought of dinosaurs? For whatever reason, no parks capture the dinosaur side of the "Bone Wars", although Cope, Marsh, and their predecessor Leidy are represented at several units through other fossils. Leidy is closely associated with the mammalian paleontology of Badlands National Park, although he also did a fair amount of descriptive work for fossils found in the vicinity of Niobrara National Scenic River. Marsh also published on Badlands fossils, and was involved with John Day Basin material (John Day Fossil Beds National Monument) and used Fort Laramie (Fort Laramie National Historic Site) as a base for collecting. Cope, though, surpasses them both when it comes to NPS paleontology. His contributions include fossils associated with several parks, among them Badlands, John Day, Niobrara, Florissant Fossil Beds National Monument, Fossil Butte National Monument, Missouri National Recreational River, and Port Kennedy Bone Cave at Valley Forge National Historical Park. The dinosaurian side of things didn't really get started until the turn of the 20th century. 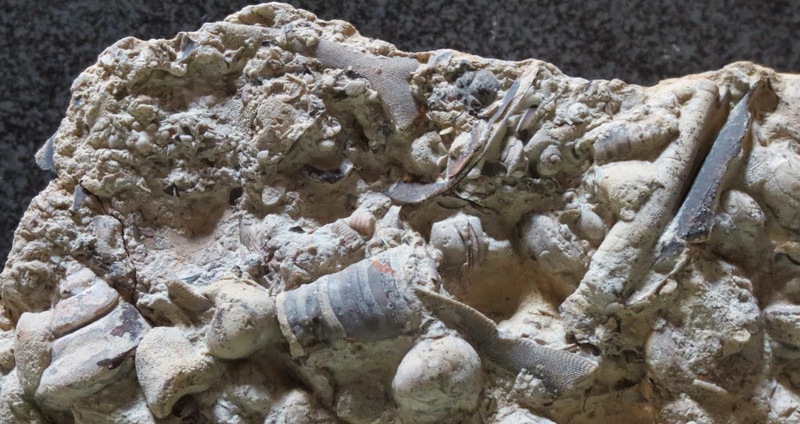 Elmer Riggs began working in the Fruita area in 1900, just outside of what is now Colorado National Monument, and in 1909 Earl Douglass discovered the great bonebed of Morrison fossils that would lead to the declaration of Dinosaur National Monument in 1915. Outside of Dinosaur National Monument, though, the presence of dinosaur fossils in NPS units has been more serendipitous than planned. 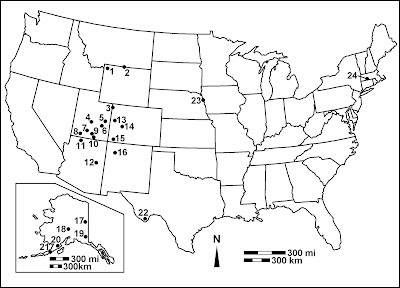 The great majority of the sites marked on the map have yielded only small amounts of bone to date. However, the amazing geologic landscapes that helped inspire the creation of many Western parks have also turned out to be great for dinosaur tracks, particularly from the Late Triassic through the Middle Jurassic. The Wingate Sandstone, Moenave Formation, Kayenta Formation, and Navajo Sandstone (and its equivalents) are especially productive. The trademark tracks of these units are from theropods, the stereotypical three-toed Grallator and Eubrontes-type tracks. 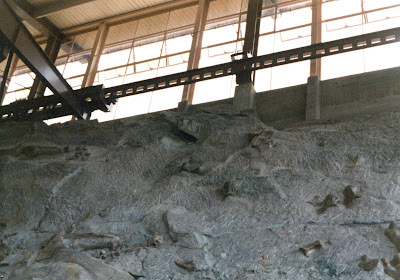 Tracks are also the main dinosaur fossils of the Alaskan parks. Here, the track-producing formations are Late Cretaceous in age, and include tracks from various theropods (including therizinosaurs), hadrosaurs, horned dinosaurs, and so forth. (Of course, if you're out at a park and you see some tracks, or bones for that matter, leave them alone! Photos only, please!) Notable exceptions to the tracks-only rule include Bryce Canyon National Park, which has microvertebrate remains of a variety of Late Cretaceous fauna including dinosaurs; Petrified Forest National Park, notable for Chindesaurus and non-Ghost Ranch Coelophysis; and Dinosaur National Monument's Late Cretaceous rival, Big Bend National Park, where the Aguja and Javelina formations provide a Texas alternative to the familiar northerly Cretaceous dinosaur faunas. A family photo of the Carnegie Quarry wall at Dinosaur NM, from back in 1990. The wall is probably the most photographed dinosaur fossil site in the Americas, and perhaps the world; it's got a head start on similar Chinese sites, but it's a lot easier to take photos now. 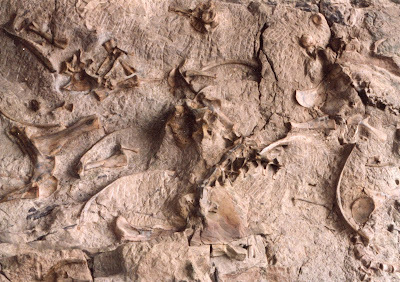 In terms of a geologic time narrative, the oldest records in the NPS are from the Chinle Formation of Petrified National Forest, when dinosaurs were still just part of an ensemble cast of vertebrates. As the deserts moved in near the end of the Triassic and made themselves comfortable, the parks of the Four Corners region were inhabited by various theropods and small sauropodomorphs who left their tracks behind. Following some shallow marine adventures in the mid Jurassic, the Late Jurassic is well-represented by the dinosaurs of the Morrison Formation, at Dinosaur National Monument, Colorado National Monument, and several other park units of the northern Colorado Plateau. The record thins again in the Early Cretaceous, although the Cedar Mountain Formation and Burro Canyon equivalent do come through in a couple of places, most notably with Abydosaurus at Dinosaur National Monument just before the end of the Early Cretaceous. The arrival of the Western Interior Seaway limited the terrestrial input for a significant part of the previous dinosaur-producing area. As it started giving way to land again, we see glimpses of the typical Late Cretaceous tyrannosaur/hadrosaur/horned dinosaur fauna at places like Bryce Canyon and Chaco Culture National Historical Park. Because of the paucity of parks in the Montana/Wyoming area with rocks of the right age, a typical Judithian or Lancian-type fauna hasn't yet been found; the closest we get is a tyrannosaur tooth at Yellowstone National Park (a Leptoceratops specimen was found just south of the park, which is kind of like a Lancian participation ribbon). Big Bend, though, makes for a heck of a substitute. Not only does it have its own variations on the tyrannosaur/hadrosaur/horned dinosaur/armored dinosaur/bonehead assortment, it also has giant sauropods, to go with the giant crocodilians and giant pterosaurs. The Alaskan record, as mentioned, is primarily tracks of Late Cretaceous dinosaurs, but there are also good paleobotanical records for the same formations. Just for the heck of it, a shot toward the top of the wall, showing a Camarasaurus skull and some of the old quarry building. And Chindesaurus bryansmalli from Petrified Forest NP. In addition, there is the Springfield Armory-associated former type of Anchisaurus, and Segisaurus halli is based on fossils found just outside of a unit of Navajo National Monument. The majority of these species have been named since 2000, and much of our knowledge of National Park dinosaurs outside of Dinosaur NM has come about in the past few decades. There's a lot out there that we don't know yet!